This sword embodies traditional Shirasaya style and grace in a modern day production. We put our focus on producing an unbelievably low priced yet fully functional Shirasaya, with emphasis placed on a razor sharp blade direct from the factory. Hardwood construction from end-to-end with high detail burgundy finish, no two are exactly alike. The blade is secured with traditional means and can be removed for care or display. The blade is tempered and you will not see a machined cutting edge. Typical retail on a product like this is $99-to-$129 and we expect to sell out of this model quickly. Includes free black cotton sword carry and storage bag. For a price like this I was surprised how well it handled all my abuses and didn't have any chips on the blade at all, only damage was the tip bending a little when i tried to thrust it through a piece of plastic. Only thing I don't like is how the handle sometime slips down and I'll have to push it back up, and because of the location of the peg, I can't slip a tsuba onto it. Took a little while for FedEx and USPS to get it here, but more than worth the wait. Absolutely gorgeous, well sized, well weighted. Sheath is perfectly made and it slides and locks perfectly. I was pleasantly surprised with this piece. 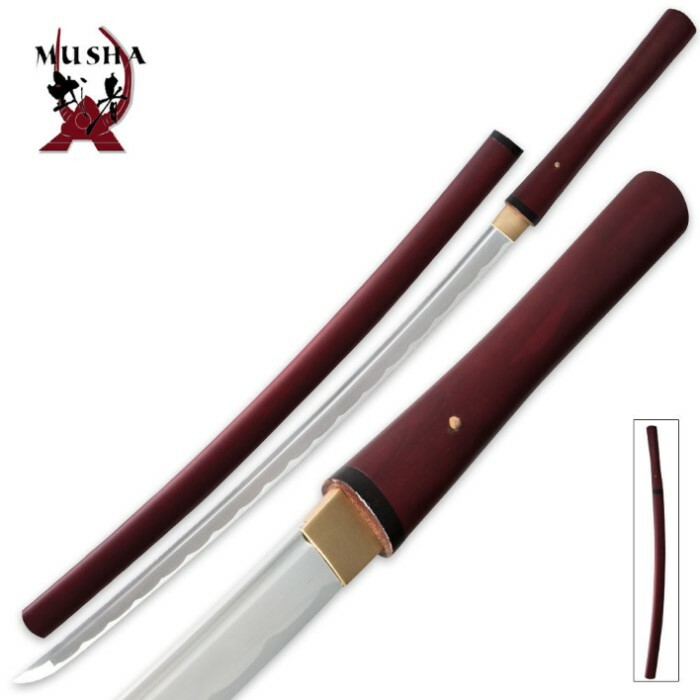 Musha makes products for those of us who do not want to use our higher end katanas on everyday cutting so they make some “no frills” blades. At this price, and at the time a 20% off sale, I consider this a bargain. The hamon is not real, but in no way does that have any bearing on the blade’s ability to cut. It is a 1045 steel. Mine was very sword sharp – sliced the shipping box in two with virtually no effort. Being a shirasaya style, it is blade heavy but feels good when swung. My blade was perfect in that there were no scratches, nicks, etc. All the fittings were tight. The saya was smooth with no blemishes. The rose wood finish is flat/matte, but I plan to experiment with some lacquer to see if I can make it look like all my others. If you are looking for an inexpensive cutter, this should serve you well. I was pleasantly surprised with this piece. Musha makes products for those of us who do not want to use our higher end katanas on everyday cutting so they make some “no frills” blades. At this price, and at the time a 20% off sale, I consider this a bargain. The hamon is not real, but in no way does that have any bearing on the blade’s ability to cut. It is a 1040 steel. Mine was very sword sharp – sliced the shipping box in two with virtually no effort. Being a shirasaya style, it is blade heavy but feels good when swung. The red wood finish is flat/matte, but I plan to experiment with some lacquer to see if I can make it look like all my others. If you are looking for an inexpensive cutter, this will serve you well. 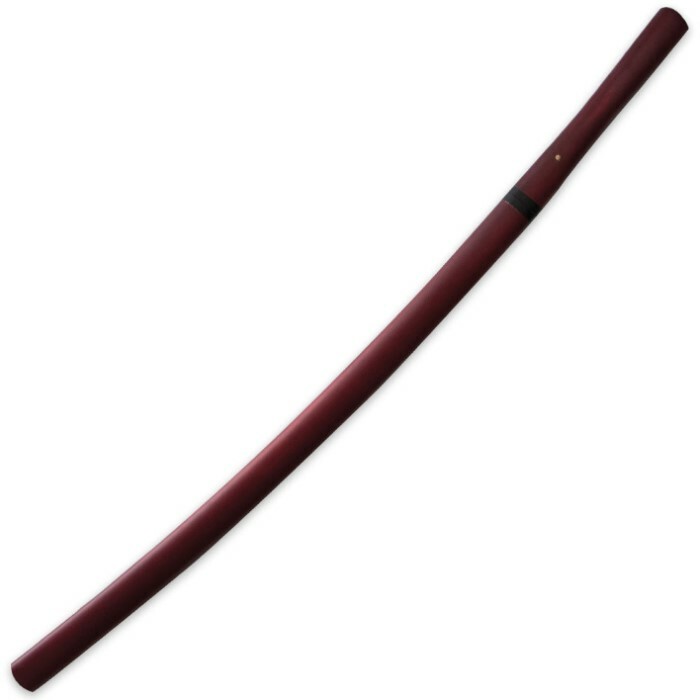 My wife ordered this shirasaya for a gift. i am happy with it its worth, more than the price tag. it is as they describe, practical. Thank you true true swards. i will be using it for practice, and yes it cuts. NOT MY FIRST ORDER. THE PRICE WAS RIGHT. PUT ORDER IN. SHIPPING IS CAREFULLY DONE NO DAMAGE FROM DELIVERY. BLADE IS SHARP. THE SCARBOARD IS TIGHT. I LIKE THE WOOD COLOR. LAST IS I WONDERED HOW SOLDIERS CARRIED THIS WEAPON ON THEIR BODY??? AROUND THE WAIST OR OVER THE SHOLDER. I WAS COURIOS ON THE BELT OR SHOLDER HARNESS. Katana arrived quickly, this shirisaya is well made and beautiful rosewood finish, single mekugi, no wiggle or jiggle, blade Is sword sharp not razor sharp, fits very snug with saya, couple knicks in blade(not edge) and habaki slightly scratched, for the price this sword is a must buy, full tang 1045 carbon steel with beautiful hardwood. Came oiled, would suggest cleaning yours asap, oil was goopy due to long period of storage. Well balanced and fully functional sword. Thanks Musashi. now known as Musha btw. 4 stars. I received my sword today it's great, sharp, balanced, but disappointed after opening and looking at the sword I have some of the coating at the end of the handle peeled off I guess since its not real rosewood? Well thanks anway truesword and will shop again! great sword hands down! beautiful balence, everything it tight fitting, blade came sharp, and arrived very quickley. oh this sword... beautiful. the dark red/blackish finish is so beautiful itself. the handle is secured by a single wooden peg, the blade is beautiful, came oiled already, nice blood groove, and a nice wrapping. just a bit longer/heavier than I am used to but it is still an amazing sword, a must have.